The US Dollar appears to have entered a new bear market. In this mid-quarter update, we analyze equity factors and their performance tendencies in recent USD bull and bear markets. 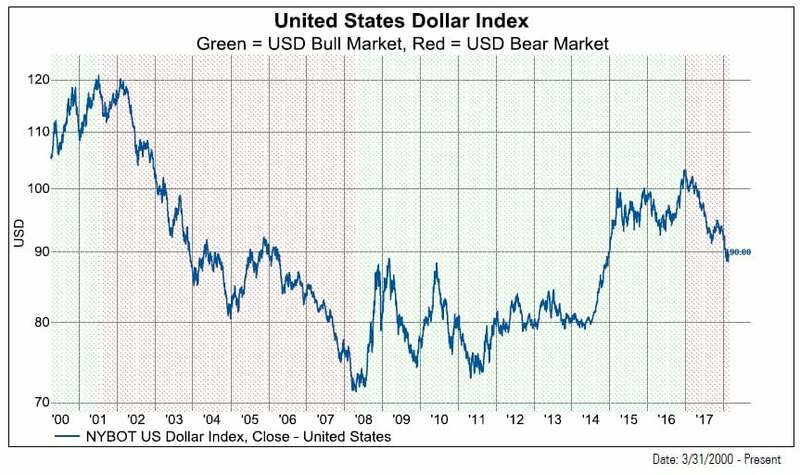 The US Dollar appears to have entered a new bear market. Historically, the best economic barometer for the US Dollar is the net savings rate as a percent of GDP. Net savings are set to plunge with new fiscal stimulus. During the last two USD bull markets, foreign stocks underperformed US stocks. Smaller companies in the developed world tend to outperform larger companies in USD bear markets. 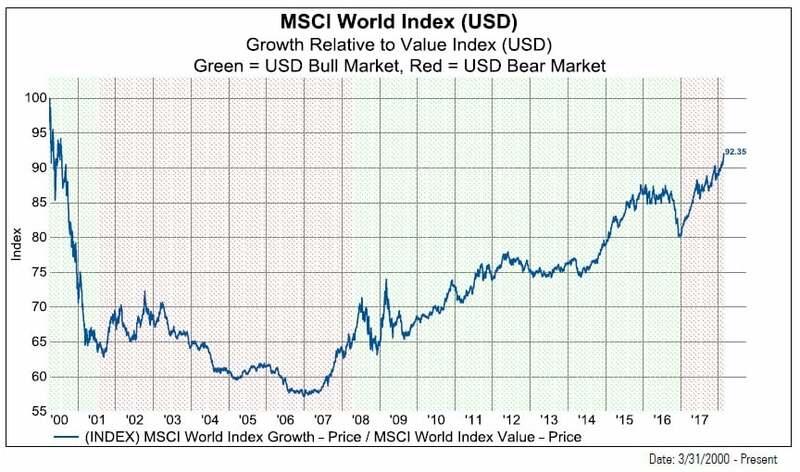 Value stocks in the developed world outperform growth stocks during a USD bear. Low volatility stocks tend to underperform during USD bear markets. 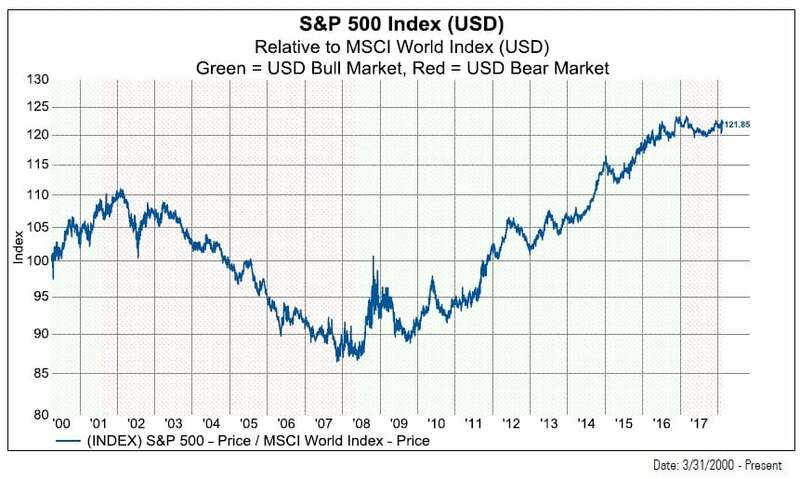 Momentum stocks in the developed world outperform more in a USD bull market but also do well in USD bear markets. High quality stocks underperform during USD bear markets. Our Knowledge Leaders Developed World Index—representative of the Knowledge Factor—historically outperforms in both USD bull and bear markets due to its large exposure to foreign companies and its tilt toward smaller companies. We would favor Knowledge Leaders due to their consistent relative outperformance. We would also favor foreign companies over domestic, value over growth and smaller over larger as we move further into a USD bear market. 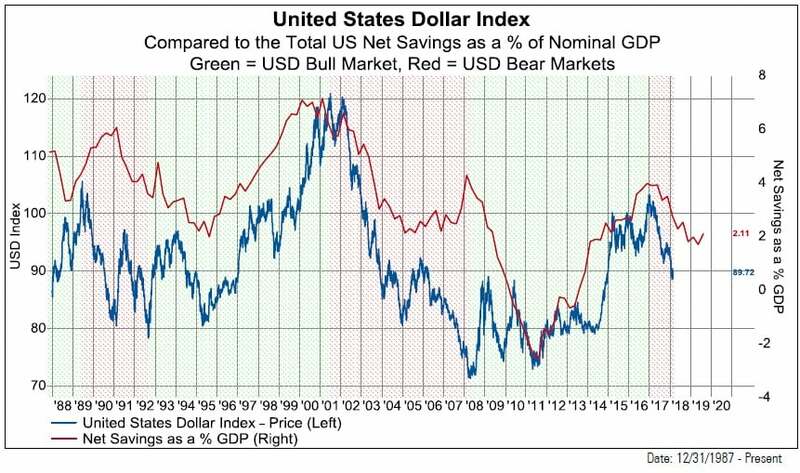 Historically, the best economic barometer for the US Dollar is the net savings rate as a percent of GDP. This captures aggregate net savings of the household, corporate and government sectors. Net savings are set to plunge with new fiscal stimulus. During the last two USD bull markets, foreign stocks underperformed US stocks. Similarly, during periods of a USD bear market, foreign markets outperformed US markets. 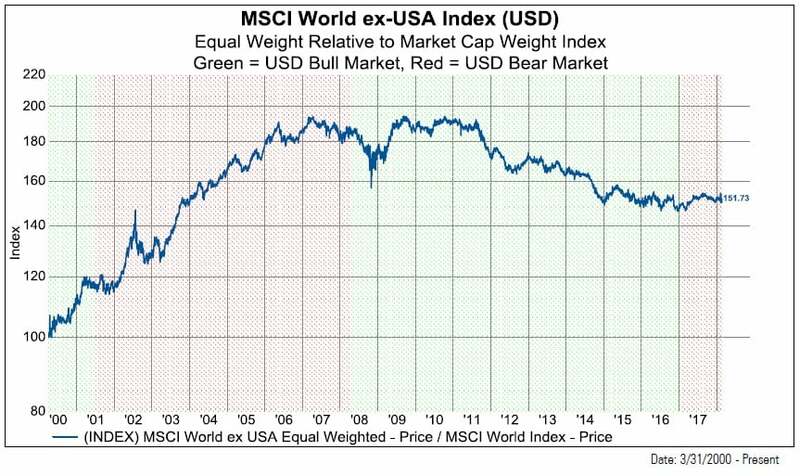 The MSCI World ex-USA is a market cap weighted index of mid/large cap foreign companies. The S&P 500 displays clear performance characteristics in USD bull and bear market phases. Cumulative relative performance since 2000 in USD bear markets is -20% while performance in USD bull markets is +45%. 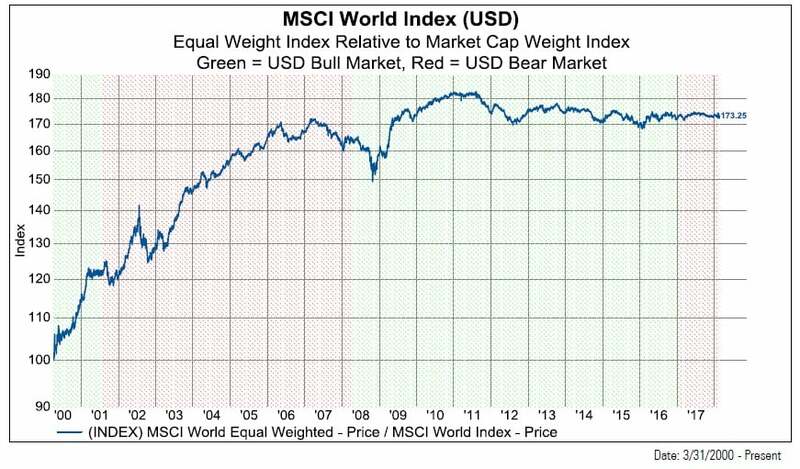 We use the MSCI World Equal Weight Index as a proxy for smaller companies. Smaller companies in the developed world tend to outperform larger companies in USD bear markets. In the 7/6/2001 – 4/22/2008 USD bear market, smaller companies outperformed by +45%. 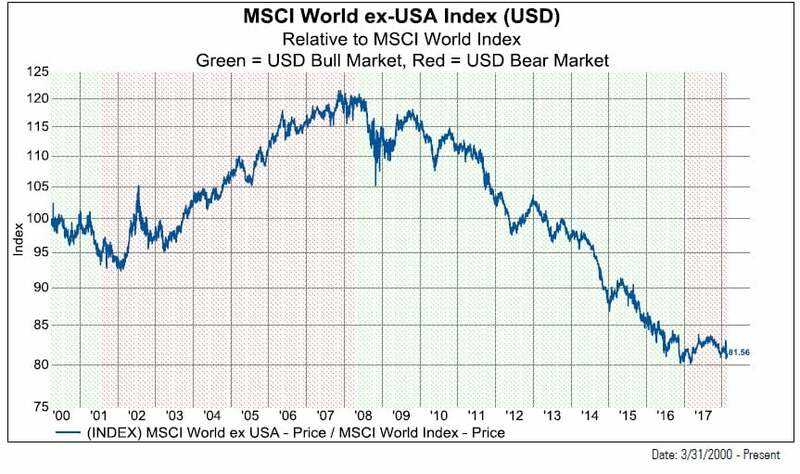 The MSCI World ex-USA Index shows the same behavior. In USD bear markets, smaller foreign companies tend to outperform larger ones. In the 7/6/2001 – 4/22/2008 USD bear market, foreign smaller companies outperformed by +65%. The same phenomenon of smaller companies outperforming played out in the US also. 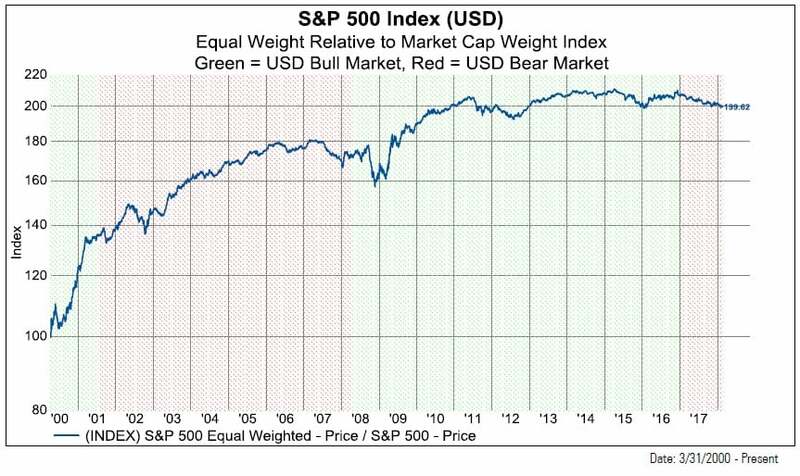 In USD bear markets, smaller companies in the S&P 500 tend to outperform their larger peers. The recent outperformance of the equal weight index validates the new currency regime. Turning to the style factor, growth stocks in the developed world outperform during a USD bull market and underperform in a USD bear market. So far, growth stocks have held on, but history suggests a rotation in relative performance.